Of who’s liberal, conservative, or even worse. Liberals and conservatives accuse each other of many political sins, sins of which they are themselves guilty. In many cases, they also attribute to themselves the same political virtues as their opponents take credit for, while in reality, they are possessed by neither. Let us call these “symmetric political illusions” (“symmetric” because they are shared by liberals and conservatives alike, and “illusion” because they are wrong). I would like to look at some of these, after which I will also describe one asymmetric political illusion (“asymmetric” because liberals and conservatives hold entirely opposed beliefs, while again both are wrong). This is purely an opinion piece. It makes no claim to any kind of empirical truth. Although I believe there is probably empirical evidence out there for the political illusions I describe, I am alternately too lazy and too busy to go out and hunt for it. So I present the following political illusions as hypotheses, while much welcoming your thoughts on them. Liberals tend to view conservatives as stupid. Conservatives tend to view liberals as stupid. Reality: Both are equally stupid, each in their own particular ways. Ideology makes people stupid. Like a bad pair of glasses, it imposes blind spots, and constricts rather than widens one’s field of vision. Whether the flaw is in the left lens or the right, the ultimate effect is much the same. Liberals tend to think they know more than conservatives about how the world really works. Conservatives tend to think they know more than liberals about how the world really works. Reality: I’d like to think conservatives might know slightly more, but that’s probably my own bias talking. I’m still enough of a philosopher to admit I’m not certain whether “reality has a conservative bias”. I do believe that conservatives are not as good as liberals at articulating what they know. We might also say that both sides are ignorant in their own ways. Liberals tend to see conservatives as angry all the time. Conservatives tend to see liberals as angry all the time. Reality: Power tends to bring with it a feeling of self-satisfaction, so that whichever side happens to be out of power always tends to seem angry to those that are in power. Right now, in my city, since a conservative mayor took power liberals seem to be very angry, but a few years ago it was the reverse. Liberals see the mainstream media as having a conservative bias. Conservatives see the mainstream media as having a liberal bias. Reality: Although there are certain media sources that are unabashedly liberal or conservative, in Canada at least, there is possibly a very slight liberal bias, but it is easily exaggerated. And it very much depends on what is meant by “mainstream” media. The CBC undoubtedly has a liberal bias, but they are not the whole of the mainstream media. Overall, the mainstream media is probably unbiased to a fault. The mainstream media purveys precious little real information at all; even biased information from that quarter would, frankly, be refreshing. Liberals tend to view conservative politicians as backed by powerful and moneyed interests. Conservatives tend to view liberal politicians as backed by powerful and moneyed interests. Reality: Both liberal and conservative politicians are backed by powerful and moneyed interests. A union is no less a powerful and moneyed interest than a corporation is, nor is it a jot less selfish. A union may sometimes act from better motives that extend beyond the particular interests of its membership. The same may be said of a corporation. And in both cases, the concentration of wealth and power has a pernicious and distorting effect on political institutions. Liberals view themselves as champions of democracy and upholders of the will of the people, while viewing conservatives as elitist and anti-democratic. Conservatives view themselves as champions of democracy and upholders of the will of the people, while viewing liberals as elitist and anti-democratic. Reality: Both conservatives and liberals are champions of democracy and upholders of the will of the people ― at least until the people fail to vote the way they’re supposed to, at which time the people are to be denounced as vicious, benighted, and ill-informed, while democracy is to be denounced as a lamentable hindrance. Liberals tend to see themselves as more virtuous and public-spirited than conservatives. Conservatives tend to see themselves as more virtuous and public-spirited than liberals. Reality: Neither is necessarily more virtuous or public-spirited than the other. Perhaps liberal virtue and public spirit tends to manifest itself in universalized claims to equality and social justice, while conservative claims to the same tend to be more particularized. For example, while a liberal might advocate for some broad notion of metaphysical, social, and economic equality, conservatives might circumscribe their quest for equality to something like “equality before the law” or “political equality”. While liberals might advocate for global or human rights both abroad and at home, conservatives tend to restrict their advocacy to legal or constitutional rights at home. 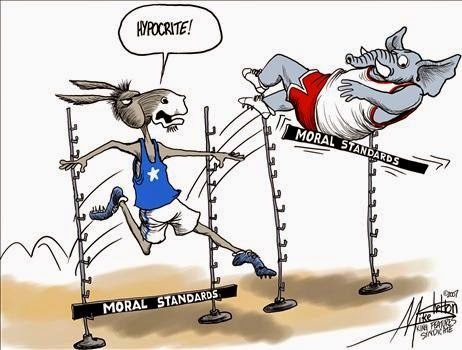 Liberals tend to see their own moral advocacy as what plain morality requires, and to look at the more limited conservative moral advocacy as parochial, even selfish. Conservatives tend to look at the liberal approach as unfeasible, too broad and ill-defined, and even as meddling in the affairs of others, and may also look at the liberal approach as selfish, insofar as it involves pursuing one’s own goals using other people’s money. Here again, both points of view have merits worth considering. I suppose then, that this is not technically an illusion, for neither side is completely wrong. However, there is a remarkable failure to see the possibility of virtue in the other, so I’ll classify it as a political illusion anyway, taking the form of a kind of cognitive blindness. CONCLUSION: Overall, there is no prima facie reason to presume that liberals are more stupid or intelligent, ignorant or knowledgeable, angry, media-controlling, virtuous, or public-spirited than conservatives. And overall, there is no prima facie reason to presume that conservatives are more stupid or intelligent, ignorant or knowledgeable, angry, media-controlling, virtuous, or public-spirited than liberals. So far I have been concentrating on illusions that those at the ends of the political spectrum seem to hold with respect to their opposing counterparts. Each side attributes to the other the very same vices, and attributes to itself the very same virtues. But on closer examination, it seems that neither side has a monopoly on any of these virtues or vices. Next, I’d like to introduce an illusion that each side has about itself, that has some pretty serious implications for each side's conduct. I will introduce this illusion by first discussing a particular issue on which liberals and conservatives typically have opposed stances. Canada formally abolished the death penalty in 1976, by a narrow vote in Parliament. An interesting legislative history of the death penalty can be found on the Department of Justice’s website. What that website does not disclose is the fact that at the time, a solid majority of Canada’s population was not in favour of abolition. Thus, this may be one of those relatively rare instances in my lifetime in which the Canadian government has taken a more or less purely moral stand on something despite widespread public opposition. As a matter of fact, almost every poll ever taken from that time (and before) to the present has shown that a majority of Canadians support the death penalty, at least in principle. Now, the death penalty is usually taken as one issue on which there is a pretty reliable ideological divide: generalizing, liberals are more likely to oppose the death penalty and conservatives are more likely to support it. To the extent that the death penalty debate tracks an ideological split in Canadian society, it would seem that more Canadians are conservative than liberal, by a considerable margin. Aside from the death penalty, I see this thesis borne out in other areas, including electoral politics. Issue by issue, there are exceptions, of course: the legalization of pot and publicly-funded health care (although this latter has seen some erosion of support of late) have broad-based support and don’t tend so much to follow the left-right divide. But I would say that, on a majority of issues, and certainly on bread-and-butter economic issues, conservatives form a majority. Which brings us to Illusion #8. Despite signs that conservatism, broadly speaking, and in one form or other, is a majority view in this country, I would contend that liberals (again, speaking broadly and in one form or another) tend to view themselves as forming a majority, while conservatives tend to view themselves as a minority, the exact reverse of what I believe is more likely the case. I don’t have a completely plausible explanation for this phenomenon. Perhaps more liberals live in cities than in rural areas, and since people generally hang out with their own kind, it’s easier for liberals to hang out with each other and form the belief that they are the majority, whereas conservatives are more spread out geographically, and perhaps feel more isolated? This would require empirical verification. In any case, this strange cognitive illusion has some interesting consequences. On the liberal side, it results in a certain complacency, with liberals mistakenly tending to assume that their political view on a given issue is the consensus one. When reality rudely intervenes, they are shocked, surprised, and can only conclude that dark, secret forces are at work to thwart the will of the people. Or if they are brought to perceive that perhaps the people truly have spoken, then they conclude that said people must be vicious, benighted, or ill-informed puppets being manipulated by a few plutocrats. For their part, conservatives are led by this illusion of minority status into a sort of siege mentality, believing that an ever-growing legion of decadents and evildoers is massing on the frontier, waiting for the opportunity to stage the coup that will bring some Marxist or atheistic despot to power. When they win political battles, as they do more often than not, they too are surprised, but they believe it to be an aberration in the overall tendency towards creeping liberalism. Thus they are neither contented nor gracious in victory. And because they see themselves as so utterly disadvantaged, I would contend that they are more likely than liberals to view underhanded means as justified in the political struggle. On both sides, I would contend that Illusion #8 has a tendency to lead to a corrosive distrust of democracy. When the democratic game doesn’t go their way, liberals will tend to view it as a roulette wheel rigged by dark plutocratic interests. When conservatives in their turn seem to be on the losing end of the game, they tend to see democracy as a mental asylum run by the patients. If we could dispel this illusion, then assuming my suspicion about the base rate of liberalism versus conservatism in Canadian society is correct, the benefits of the truth might be good to both sides. Liberals, with a correct view of their situation, might lose their infuriating tendency to speak on issues in the “royal we” where it is not necessarily warranted — “We all know that the death penalty is wrong”. This will only alienate the people who know no such thing. This is especially infuriating when framed in terms of the putative barbarism or moral or cognitive deficiency of those who do not “know” what “we” all know. Who knows, it might also have the effect of eliminating much of their complacency about their views and make them a more effective political force than they currently are in Canada. Conservatives, with a correct view of their situation, might lose their unpleasant siege mentality and paranoia, which is a huge turnoff to many people who might otherwise be disposed to support many of their views. No longer viewing every political issue as a matter of existential gladiatorial combat in which they are outnumbered by their foes, they might devote more effort to explanation and persuasion, and less to attacking and denigrating.